6 Star Godfest Exclusive Player’s Choice Godfest results have been officially announced and will take place this Friday starting at 12am PST. All rolls will feature +44 to a random stat and only the voted GFE will be featured (which means no Sonias/Metatrons etc.). This post will cover my thoughts and opinions of the voted cards along with who I felt should have made it in, but failed to make an appearance. Unlike previous Player’s Choice Godfests, GungHo did not have a running tally of the leader board and many votes probably went to waste on the top winners. For the most part, the voting makes sense with the featured cards as the majority of them have a place in the current (or near future) meta. However, what is most shocking is the fact that 11 six-star Godfest Exclusives were voted in. From the data collected by me in the previous December PCGF, you have a disparagingly low chance to roll a six-star GFE. Player’s Choice Godfests should be used to acquire the best pantheon cards available and by having 44% of the featured monsters being nearly unobtainable, we have essentially defeated the purpose of a PCGF. Six-star GFE are best acquired during a 5x GFE event or the special 10-stone REM (if it returns). I understand that those events do run the risk of other GFE appearing, but if we want 11 six stars, you are quite likely to roll them anyway. Six-star GFE will greatly lower the chances of rolling a featured monster and will most certainly add to the disappointment of higher silver egg rolls. I will continue to update this page as I write the additional monster reviews and have been quite busy with all the newly released content and real life issues. I posted this well knowing I am missing some monsters as I want to give you some information now or at least the handy reference chart for what rolls out on each day. Your patience is appreciated! When making the decision to roll or save your magic stones, you need to determine if the featured pantheons can benefit or compliment your teams. Chasing for one specific monster is unwise as you will most likely be disappointed and should ideally have Godfests that overlap with many target cards. Remember all monsters that come out of the REM will qualify for Skill Inheritance so do not be too hasty when selling dupes. For a more detailed team building help, please refer to my full list Popular Leader’s and their Full Sub List Post. If you are wondering which Four Gentlemen 300k card you should purchase, please read my Comparison Post. Lastly, to find more information about a specific pantheon or monster, refer to my Master List to better refine your search. 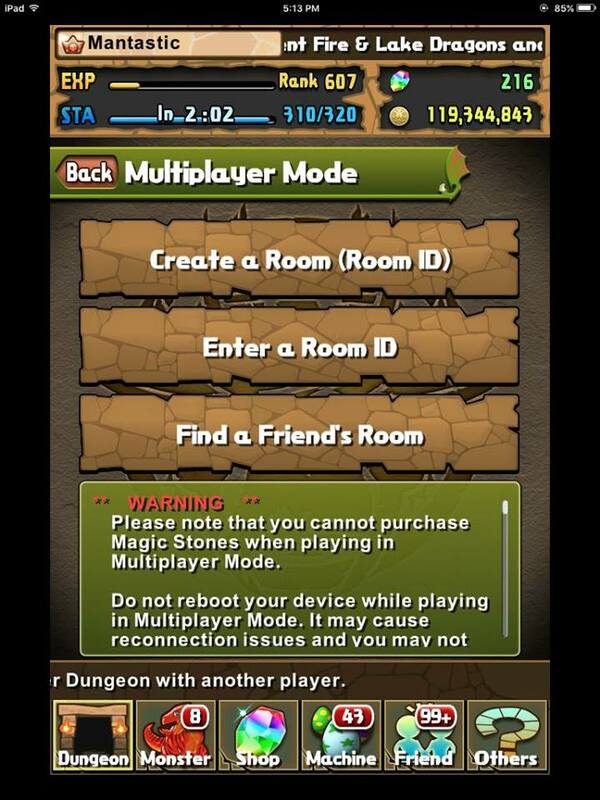 The 55 Million Downloads Godfest makes a special occasion for both GungHo and players. There are not many games that can claim to have as widespread of a following as Puzzle and Dragons and the players are being wonderfully rewarded with a NA first of 5x Godfest Exclusives. A typical Godfest has these hard to obtain cards at a 3x rate and these increased values should help players secure some of their favourite cards. In the distant past, we were fortunate enough to have 4x GFE that was paired alongside various pantheons; however, during the 55 Million Godfest, there will be no accompanying pantheon alongside and we will only have the Gala of Tides. It is uncertain how this will influence the roll rates and GungHo will never disclose this information so we are still at the mercy of RNGesus. When deciding to roll for either day 1 or 2, you have to take a look at the featured GFE as there is some overlap and the decision ultimately lies in your unique box and situation. North America may never receive the 10-stone GFE REM and if you are like me, and have been hoarding stones for months, it may be time to shake the Golden Dragon’s arm as this will probably be the best opportunity to acquire Godfest Exclusives and Monster Points. Sitting on hundreds of Magic Stones can put a damper on your progression and there is a certain degree of opportunity cost and benefiting from cards before powercreep reduces their value. I will be rolling and recording my conquest with as few tears as possible in a subsequent posting. Another thing to consider is every roll will come out with a +50 to a single stat. This is a wonderful collateral benefit and if you are having troubles deciding to sell or fuse, I encourage you to read my post HERE discussing the matter. Day 1 has the lovely Sonias who despite their best efforts, are starting to fall behind due to powercreep as leads. As subs, they are wonderful on their respective mono-colour teams or assistants for Skill Inheritance. The Odins are more luxury based or niche in comparison. Dark Kali is the big prize of the day and is a vital sub on Ra Dragon . Finally, the Metatrons are falling behind due to powercreep. Player’s Choice Godfest is one of the most anticipated times of the year for all Puzzle and Dragoners. It is a time where the community collectively votes for the most popular gods and is a great way to help populate your monster box with numerous strong cards. 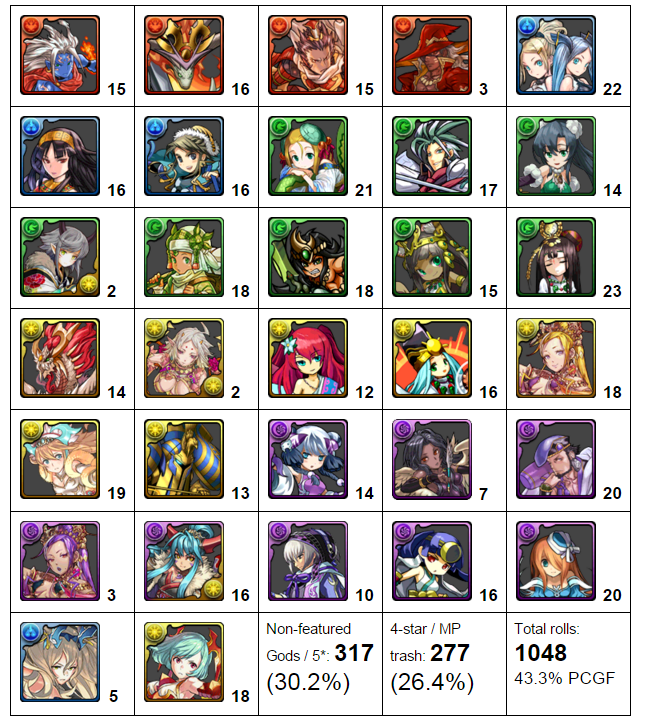 In my previous post, I compared PCGF and 4x Godfest Exclusive (GFE) events and came to the conclusion that it is better to roll PCGF for newer accounts/players missing numerous key cards. However, with the promise of 4x rates for all the featured monsters, my approach needs some tweaking. Due to not knowing the true rates of any godfest, we cannot do any mathematical comparisons; however, the 4x rates should imply the featured GFE (and most importantly 6* GFE) are at a similar hit rate. You may still get less MP per stone spent as numerous non-GFE are also featured, but if you are chasing the featured 6-stars AND the other featured gods, this may be the best time to roll. Furthermore, each monster comes out with a +50 to a random stat and this will help you achieve +297 faster. However, take these predictions with a grain of salt as I do not know the rates and can only guess. In addition, all of these monsters qualify for Skill Inheritance so please do not hastily sell or feed them off without taking a moment to think if they can benefit your various teams. I also strongly encourage you to read my Advanced Strategies post on Skill Inheritance to gain a better understanding on how to make the most of your active skills. Lastly, if you wish to read about virtually any other REM monster not listed below, please refer to my Master List which will direct you to the appropriate page. The voting for North America was done rather well as we managed to include nearly all the top tier cards while having some forethought into voting in cards that will become relevant with the release of the 4 Gentlemen 300k MP cards and new Awoken evolutions.